Fifteen years after the collapse of the Soviet Union, "U.S.-Russia relations are clearly headed in the wrong direction," finds an Independent Task Force on U.S. policy toward Russia sponsored by the Council on Foreign Relations. "Contention is crowding out consensus. The very idea of a 'strategic partnership' no longer seems realistic," it concludes. The bipartisan Task Force was chaired by former Senator John Edwards and former Congressman and Housing and Urban Development Secretary Jack Kemp and directed by Council Senior Fellow Stephen Sestanovich. The Task Force notes significant recent economic progress in Russia. "Between 2000 and 2004 the number of Russians living below the government's poverty line dropped from forty-two million to twenty-six million. The national unemployment rate—over 10 percent in 2000—is now about 7 percent ... [and] a middle class appears to be emerging." At the same time, when President Bush has made democracy a goal of American foreign policy, Russia's political system is becoming steadily more authoritarian, the Task Force charges. "The political balance sheet of the past five years is extremely negative. The practices and institutions that have developed over this period have become far less open, pluralistic, subject to the rule of law, and vulnerable to the criticism and counterbalancing of a vigorous opposition or independent media." As Russia prepares to host the G8 summit this summer, the report, Russia's Wrong Direction: What the United States Can and Should Do, affirms that Russia's cooperation is central to achieving American interests. "On a whole host of issues—Iran, energy, HIV/AIDS, and preventing terrorists from acquiring weapons of mass destruction—it's vital to have Russia on our side," said Kemp. "The G8 summit may be a watershed on many of these issues—Iran and energy in particular. It's a real opportunity to lock in more helpful Russian policies. But if we don't see progress, people are going to ask what Russia is doing in the G8 in the first place." "U.S.-Russia cooperation can help the United States handle some of the most difficult issues we face," said Edwards. "Yet regrettably, cooperation is becoming the exception, not the norm. This report is a wake-up call that we need to get U.S.-Russia relations back on track to meet the challenges that face both of our countries." Consistent with this, the report argues, "Although President Putin is presiding over the rollback of Russian democracy, the United States should work with him to keep Iran from acquiring nuclear weapons and to keep terrorists from attacking either his country or ours." The Task Force is comprised of many of the nation's preeminent Russia scholars and policy practitioners. It applauds recent Russian support for containing Iran's nuclear program and cooperative initiatives to secure nuclear materials, but cautions that "U.S.-Russia relations are now marked by a growing number of disagreements. The partnership is not living up to its potential." De-democratization: The report finds that Russian political institutions are becoming "corrupt and brittle." As a result, "Russia's capacity to address security concerns of fundamental importance to the United States and its allies is reduced. And many kinds of cooperation—from securing nuclear materials to intelligence sharing—are undermined." Energy supplies: "Russia has used energy exports as a foreign policy weapon: intervening in Ukraine's politics, putting pressure on its foreign policy choices, and curtailing supplies to the rest of Europe. The reassertion of government control over the Russian energy sector increases the risk this weapon will be used again." The war on terror: The Task Force finds "a seeming Russian effort to curtail U.S. and NATO military access to Central Asian bases," a sign that Russia is retreating from the idea that "success in Afghanistan serves a common interest." Russia hosting the G8: "A country that has in the space of a single year supported massive fraud in the elections of its largest European neighbor and then punished it for voting wrong by turning off its gas supply has to be at least on informal probation at a meeting of the world's industrial democracies." Democratization: "To go beyond mere expressions about the rollback of Russian democracy, the United States should increase—not cut—Freedom Support Act funds, focusing in particular on organizations committed to free and fair parliamentary and presidential elections in 2007–2008." G8: "To protect the credibility of the G8 at a time when many are questioning Russia's chairmanship, the United States should make clear that this role does not exempt Russian policies and actions from critical scrutiny. Keeping the G8 a viable international forum will require a de facto revival of the Group of Seven (G7). Without creating a completely new forum, the United States and its democratic allies have to assume a stronger coordinating role within the old one." Energy policy: "The United States cannot expect Russian energy policy to substitute for its own. If America and its allies lack a comprehensive strategy to increase supplies of energy, diversify the number of suppliers and transport routes, and promote energy efficiency, they will only increase Russia's ability to exploit its market position for political purposes." The report adds, "To limit the use of oil and gas exports as an instrument of coercion—and as a prop for authoritarianism—the United States needs to agree with other governments, especially our European allies, on measures to assure that state-controlled Russian energy companies act like true commercial entities." Trade and the WTO: "We strongly favor accession, but on this condition: It must not be a political present," says the Task Force. "Accession will promote further liberalization of the Russian economy and should signify full Russian acceptance of a rules-based international trading system.... American negotiators should not, however, attempt to resolve important remaining issues under the pressure of an artificial deadline, least of all the deadline of this year's G8 summit.... It would be far better for the G8 meeting to come and go without Russia in the WTO, than to bring Russia into the organization on preferential terms." Iran: "A Russian policy that limits nuclear cooperation with Iran to nonsensitive technologies would justify dropping our historic objections to the Bushehr reactor." For its part, Russia needs to accept that "the international community may soon face an Iran so determined to produce fissile material that all nuclear cooperation between Moscow and Tehran, including the Bushehr reactor, should cease." Russia's neighbors: "The United States should cede no veto or undue deference to Russia over American relations with the states of the Russian periphery.... There is nothing legitimate about limiting the opportunity of its neighbors to deepen their integration into the international economy, to choose security allies and partners, or to pursue democratic political transformation." The report further recommends, "Post-Soviet states that share America's approach to major international problems and can contribute to resolving them should be able to count on greater support." 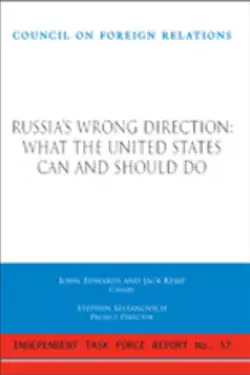 The 2008 election: The goal of Western governments must be to win public commitments—and specific, concrete actions—by Russian officials to conduct the coming electoral cycle on an open, constitutional, and pluralist basis. "Early and explicit discussion ... is far preferable to harsh but meaningless critiques on election day and the morning after." "Since the end of the Cold War, successive American administrations have sought to create a relationship with Russia that they called a 'partnership.' This is the right long-term goal, but it is unfortunately not a realistic prospect for U.S.-Russia relations over the next several years," says the report. In the short run, the United States needs to see Russia for what it is now. "The real question that the United States faces in this period is not how to make a partnership with Russia work, it is how to make selective cooperation—and in some cases selective opposition—serve important international goals," concludes the report. Stephen E. Biegun is the Vice President for International Governmental Affairs at Ford Motor Company. He formerly served as the National Security Adviser to Senate Majority Leader Bill Frist. He worked in the White House from 2001 to 2003 as Executive Secretary of the National Security Council and before that served for fourteen years as a foreign policy adviser to members of both the House of Representatives and the Senate. From 1992 to 1994, he was the Resident Director in the Russian Federation for the International Republican Institute. Coit D. Blacker is Director of the Freeman Spogli Institute for International Studies and the Olivier Nomellini Family University Fellow in Undergraduate Education at Stanford University. He also serves as Cochair for Stanford's International Initiative. During the first Clinton administration, he served as Special Assistant to the President for National Security Affairs and Senior Director for Russian, Ukrainian, and Eurasian Affairs on the staff of the National Security Council. Robert D. Blackwill joined Barbour Griffith and Rogers International as President in November 2004, after serving as Deputy Assistant to the President and Deputy National Security Adviser for Strategic Planning under President George W. Bush. He also served as Presidential Envoy to Iraq, as the Bush administration's coordinator for U.S. policies regarding Afghanistan and Iran, and as U.S. Ambassador to India. Prior to that, he was the Belfer Lecturer in International Security at Harvard University's John F. Kennedy School of Government. Antonina W. Bouis is a consultant on cultural affairs involving Russia for businesses, museums, and nongovernmental organizations. She is coauthor of a new biography of Andrei Sakharov and translator of Alexander II, by Edvard Radzinsky. The founding Executive Director of the Soros Foundations (1987-92), she is Vice President of the Andrei Sakharov Foundation and a member of the advisory board of American Friends of the Tretyakov Gallery and the PENTranslation Committee. Mark F. Brzezinski is a partner at the law firm of McGuireWoods LLP, where he manages the international law practice in Washington, DC. He served on the National Security Council staff in the Clinton administration, and from 1999 to 2000 served as its Director for Russia and Eurasia. Richard R. Burt serves as Chairman of Diligence Inc., an international business intelligence and risk advisory services firm. He is also a Senior Adviser to the Center for Strategic and International Studies. He was U.S. Ambassador to the Federal Republic of Germany from 1985 to 1989 and, prior to this, he worked at the State Department as Assistant Secretary of State for European and Canadian Affairs. From 1977 to 1980, he worked in Washington as the national security correspondent for the New York Times. John Edwards, cochair of the Task Force, is the Director of the Center on Poverty, Work, and Opportunity at the University of North Carolina at Chapel Hill. He represented North Carolina in the Senate from 1999 to 2005. In 2004, he was chosen as the Democratic nominee for Vice President of the United States. Robert J. Einhorn is Senior Adviser at the International Security Program of the Center for Strategic and International Studies. Previously, he served in the U.S. Department of State for twenty-nine years, and from 1999 to 2001, he was Assistant Secretary of State for Nonproliferation. John Lewis Gaddis is the Robert A. Lovett Professor at Yale University, where he teaches Cold War history, grand strategy, and biography. His most recent book is The Cold War: A New History. John A. Gordon served as the president's Homeland Security Adviser, as the Deputy National Security Adviser for Counterterrorism, and as the National Director for Counterterrorism. A retired U.S. Air Force General, he was Undersecretary of Energy and the first administrator of the National Nuclear Security Administration. He has also served as Deputy Director of Central Intelligence and spent thirty-two years in the Air Force with a concentration on research and development, strategic planning, missile and space operations, intergovernmental operations, and international negotiations. James A. Harmon is Chairman of Harmon and Co., a financial advisory firm, and Chairman of the World Resources Institute, a global policy and research institution. He is also a Senior Adviser to the Rothschild Group, a global corporate advisory firm. He was Chairman and CEO of the U.S. Export-Import Bank from 1997 to 2001. From 1974 to 1986, he was a Partner of Wertheim and Co. (an investment bank) and was Chairman and CEO of Wertheim Schroder from 1986 to 1996. He is also a member of the boards of directors of a number of companies. Steven E. Hellman is the Chairman and Cofounder of OILspace, a web-based technology solutions provider for the international oil industry. He also cofounded one of the world's largest physical oil-trading companies, a real estate investment company operating in Russia and the United States, and a mortgage securitization company. Fiona Hill is a Senior Fellow at the Brookings Institution in Washington, DC. She was previously Director of Strategic Planning at the Eurasia Foundation. From 1991 to 1999, she held various positions at Harvard University, including Associate Director of the Strengthening Democratic Institutions Project at the John F. Kennedy School of Government, Director of Harvard's Project on Ethnic Conflict in the former Soviet Union, and Coordinator of Harvard's Trilateral Study on Japanese-Russian-U.S. Relations. Jack Kemp, cochair of the Task Force, is Founder and Chairman of Kemp Partners, a strategic consulting firm that seeks to provide clients with strategic counsel, relationship development, and marketing advice in helping them accomplish business and policy objectives. From January 1993 until July 2004, he was Codirector of Empower America, a Washington, DC-based public policy and advocacy organization he cofounded with William Bennett and Ambassador Jeane Kirkpatrick. Prior to that, he served as Secretary of Housing and Urban Development and represented New York in the House of Representatives for eighteen years. In 1996, he received the Republican Party's nomination for Vice President of the United States. Clifford A. Kupchan is Director for Europe and Eurasia at the Eurasia Group, the political risk consultancy. Previously, he served as Vice President of the Nixon Center, and before that worked on Russian affairs at the U.S. Department of State. Jessica T. Mathews is President of the Carnegie Endowment for International Peace, which in addition to its Washington, DC, headquarters, maintains a forty-person office in Russia: the Carnegie Moscow Center. Previously, she worked on Capitol Hill, in two presidential administrations, as a member of the Editorial Board and as a columnist for the Washington Post, and for ten years as Vice President and Director of Research at the World Resources Institute. Michael A. McFaul is the Peter and Helen Bing Senior Fellow at the Hoover Institution, where he codirects the Iran Democracy Project. He is also the Director of the Center on Democracy, Development, and Rule of Law at the Freeman Spogli Institute and an Associate Professor of Political Science at Stanford University. He is also a nonresident Senior Associate at the Carnegie Endowment for International Peace. Mark C. Medish is a partner at the law firm Akin Gump Strauss Hauer and Feld LLP in Washington, DC, and a Visiting Scholar at the Carnegie Endowment for International Peace. He served on the staff of the National Security Council as Senior Director for Russian, Ukrainian, and Eurasian Affairs from 2000 to 2001, and worked at the Department of the Treasury as Deputy Assistant Secretary for International Affairs from 1997 to 2000. He also served as a Senior Advisor at the U.S. Agency for International Development and the United Nations Development Programme from 1994 to 1996. Prior to that, he practiced law at Covington and Burling. Stephen Sestanovich, director of the Task Force, is the George F. Kennan Senior Fellow for Russian and Eurasian Studies at the Council on Foreign Relations. He is also Kathryn and Shelby Cullom Davis Professor of International Diplomacy at Columbia University. From 1997 to 2001, he served as Ambassador-at-Large and Special Adviser to the Secretary of State for the Newly Independent States. David R. Slade is a Project Finance Partner in the New York office of Allen and Overy, an international law firm. He focuses on oil and gas and other natural-resource and energy-infrastructure projects in the states of the former Soviet Union, frequently acting for the U.S. Export-Import Bank and the Overseas Private Investment Corporation. He and his firm have worked on the Russian Oil and Gas Framework Agreement, the Vysotsk oil terminal, the Caspian oil pipeline, the Kovyka gas pipeline, the Sakhalin oil projects, and the Azeri early oil and BTC pipeline projects, among others. Walter B. Slocombe is a member of the Washington, DC, law firm of Caplin and Drysdale, Chartered. He has held a variety of senior positions in the Department of Defense, including Undersecretary of Defense for Policy from 1994 to 2001. During May-November 2003, he worked in Baghdad as the Coalition Provisional Authority's Senior Adviser for National Security and Defense. He has also served on the Presidential Commission on Intelligence Capabilities Regarding Weapons of Mass Destruction. Strobe Talbott is President of the Brookings Institution. He served as Deputy Secretary of State from 1994 to 2001 and, before that, as Ambassador-at-Large and Special Adviser to the Secretary of State for the Newly Independent States. He has written several books on U.S.-Soviet relations, as well as The Russia Hand: A Memoir of Presidential Diplomacy. Judyth L. Twigg is Associate Professor and Associate Director at the L. Douglas Wilder School of Government and Public Affairs at Virginia Commonwealth University. Her work focuses on issues of health, demographic change, and health care reform in Russia. She has been a consultant to the World Bank, the U.S. government, and several leading nongovernmental and research organizations. Margaret D. Williams directs the World Wildlife Fund's Bering Sea Program and Russia projects. She serves as the Chair of the WWF's Arctic team and is also editor of Russian Conservation News, a quarterly journal. Previously, she served as a consultant to the World Bank on biodiversity projects in Central Asia and Macedonia. Dov S. Zakheim is Vice President of Booz Allen Hamilton, a global strategy and technology consulting firm. From 2001 to 2004, he served as the Undersecretary of Defense (Comptroller) and Chief Financial Officer for the Department of Defense. He previously served as Deputy Undersecretary of Defense for Planning and Resources (1985-87).